The throwing stick is a simple tool used in hunting small game and waterfowl. 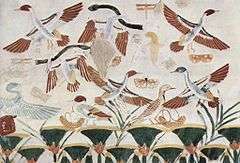 The Ancient Egyptians used throwing sticks to hunt ducks, as seen in several wall paintings. The 18th dynasty Pharaoh Tutankhamun was a known lover of duck hunting and used the throwing stick in his hunts. Gimel, the third letter of many Semitic alphabets, may have been named after a weapon that was either a staff sling or a throwing stick, ultimately deriving from a Proto-Sinaitic glyph based on an Egyptian hieroglyph. The Aborigines of Australia used the boomerang. 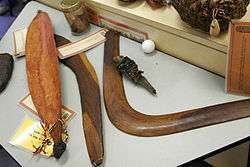 Although returning boomerangs are found in many Aboriginal cultures and will return to the user if thrown properly, the choice weapon of most cultures was the heavy non-returning boomerang that could also be wielded as a club or knife for attacking close kangaroo, wallaby, and emu by using it as a stabbing weapon. Other titles for the throwing stick are: rabbit stick, throwing club, killer stick, baton, boomerang, and kylie. The throwing stick can also be used as a weapon in human combat, though the heavy non-return boomerang was the only one truly effective in this use. As a survival tool, the throwing stick is one of the most effective and easiest tools to obtain. Other than a weapon, it can also be used as a digging tool for making fire-pits and underground shelter. A curved limb will suffice as a throwing stick. Ancient throwing sticks were believed to be made of hardwood with a weighted or curved end to one side to impart momentum so the stick stays straight and does not wobble in mid-flight. Some throwing sticks and their variations are about 2 to 3 feet long pieces of thick hardwood, usually about the circumference of the user's wrist. When they are thrown, they spin, creating the image of a sort of blurry disc. Pommel Point Throwing Sticks are not actual variations of the throwing stick. They are simply throwing sticks with slightly blunt points that can crush skulls if they travel at sufficient speed. Thus, it is also dubbed the skull crusher throwing stick. Return boomerangs have a flat convex surface that must be thrown at a 45 degree angle with a sharp flick of the wrist. The Egyptians described it as "-returning to the feet of the thrower and be ready at hand for the next flight of ducks." Atlatl - spear thrower which has been called a throwing stick.